Every one of the North Myrtle Beach vacation rentals that A Place at the Beach V offers will provide what guests need to simply arrive, relax and enjoy. Each condominium on this resort has a fully equipped kitchen. Prepare a quick breakfast before heading out to enjoy the warm South Carolina sunshine on the stunning South Carolina shoreline that is just across the street from this resort. Another option is to plan a trip on a chartered fishing expedition and then bring your fresh catches back to your condo where you can create a scrumptious dinner for the family. 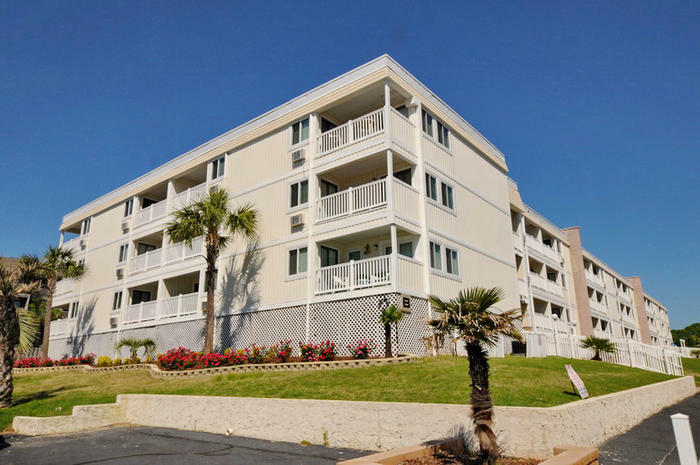 Convenient extras are more than just kitchens at A Place at the Beach V. The resort has a grilling area with picnic tables where guests can enjoy a family cookout of fresh grilled fish or all American hamburgers and hot dogs. Vacationers will also find laundry facilities on site where guests can wash away sand from swimsuits after full days spent on the beach. A Place at the Beach V also provides convenient parking near each rental. The condos nestled in A Place at the Beach V offers amenities to enhance guest enjoyment. Entertainment in the rentals is provided by televisions and wireless Internet access. Each condominium will have multiple televisions, some flat-screen, which guests can use to keep up with their favorite programs. These condominiums also have wireless Internet access so guests can keep up with email and social media or surf for exciting activities in the area. Guests will also love to relax on the ocean view balconies that these rentals provide. One of the best features of A Place at the Beach V is the location that it offers. With the beach so close to these rentals most vacationers will want to fill their days with fun in the waves or relaxing on the sandy shore. Take a surf or boogie board and frolic in the ocean waves, stroll along the shoreline collecting shells, fish from the shore, fly a kite in the saltwater breeze or simply relax on the beach enjoying the warm sunshine as you build sand sculptures with the kids. When you leave the beach wash away the persistent sand in the outdoor shower that the resort provides. For those who love to be immersed in saltwater breezes and ocean views, but might not enjoy getting sand in their shorts, A Place at the Beach V provides options for water fun without the sand. Just below the condos this resort has a sparkling water swimming pool where guests can enjoy water fun and rays of warm South Carolina sunshine. While staying on at A Place at the Beach V guests will also enjoy access to an oceanfront sun deck that features an additional sparkling swimming pool. Choose one of these two sun decks and relax in a lounge chair, taking a dip in the refreshing water to cool off if you get too warm. A vacation in North Myrtle Beach does not have to focus solely on the ocean and water fun. When staying in A Place at the Beach V guests will be positioned near many exciting attractions and activities. The area has more than 100 golf courses and is known as the Seaside Golf Capital of the World. On this stretch of the South Carolina shoreline vacationers will also find a wide variety of shopping, amusement parks and award winning live entertainment. Whether you want to fill vacation days learning to stand-up paddle board, going on a dolphin cruise, fishing, shag dancing or golfing A Place at the Beach V will be an excellent choice for your beach vacation accommodations. Elliott Beach Rentals is not affiliated with onsite management or the HOA of A Place At The Beach V.